Turn your mind back to a time when gold fever was spreading like wildfire, and Melbourne was the world’s richest city. Standing right here in 1883, you were at the epicentre of a global mining boom, and there is little doubt you’d already know the name ‘E.W. Cole’. His influence on the landscape looms large even today, but it’s his message of hope, peace and equality that should be written into our hearts forever. Take a breath, lend us your ears, and let us remind you of the magic that was, and still is, Cole’s Rainbow. In the mid-1800s a young Englishman by the name of Edward William (E.W.) Cole was just one of many who rode the wave of migration to Melbourne in the hunt for gold. Having no luck on the unforgiving goldfields he instead established a small, thriving trade selling refreshing lemonade to weary prospectors. Cole’s entrepreneurial spirit continued to grow, and after successful property investments in Castlemaine and Adelaide he returned to Melbourne to establish a pie stand on Russell Street. He began selling his delicious pies at night while researching and writing in the city’s Public Library during the day. It was here that Cole’s love of knowledge and books took hold and he started dreaming of something truly magical for himself and the people of Melbourne. Now, more than 130 years later, you are part of Cole’s story. By 1873, E.W. Cole began to cement his position as a serious and successful businessman in Melbourne. After selling secondhand books (as well as those he’d written) at the Eastern Market, he took his first lease on his very own store just a short walk from here. His Bourke Street East store was advertised as ‘the prettiest sight in Melbourne’. Glittering with mirrors and shining with brass, it sported two little mechanical men at the entrance that turned over a series of advertising boards that fell against each other with a tinny clash. Cole then purchased Augustine Barbete’s Spanish Restaurant in Bourke Street. The store had a 12-metre frontage and he virtually gutted it. The two upper floors became circular balconies that shed daylight from an arched glass roof to the ground floor. He added new, bigger mirrors and brass pillars to create a rich, magical space that started the whole city talking. Police had to control the crowds when he opened the premises on Melbourne Cup Day in 1883. Even Rudyard Kipling and Mark Twain visited this very Arcade during their travels to Australia. By the end of the gold rush that had brought him to Victoria, E.W. Cole’s book empire extended from Bourke Street across Collins Street alongside Howey Place. It boasted “Two Million Books” on its signage – certainly one of the largest stocks of books in the world. Cole dressed his staff in brilliant scarlet jackets and after midday a pianist played popular tunes. In this happy, circus-like atmosphere, customers were encouraged to sit and take it all in. Readers could rest in comfortable chairs amid signs that said: ‘Read for as Long as You Like – Nobody Asked to Buy’. The bookshop prospered and E.W. Cole eventually opened various new departments including toys and printing departments, through which he produced and sold his own publications including the legendary Cole’s Funny Picture Book. But it didn’t stop there. Fame and fortune was not the end Cole had in mind. His vision was much, much bigger. Eventually, E.W. Cole had Howey Place paved and roofed at his own expense to link all the buildings of his world-famous Book Arcade. The roof remains in-situ today, as does the facade of 271 Little Collins Street, the former location of the Book Arcade’s toy department. 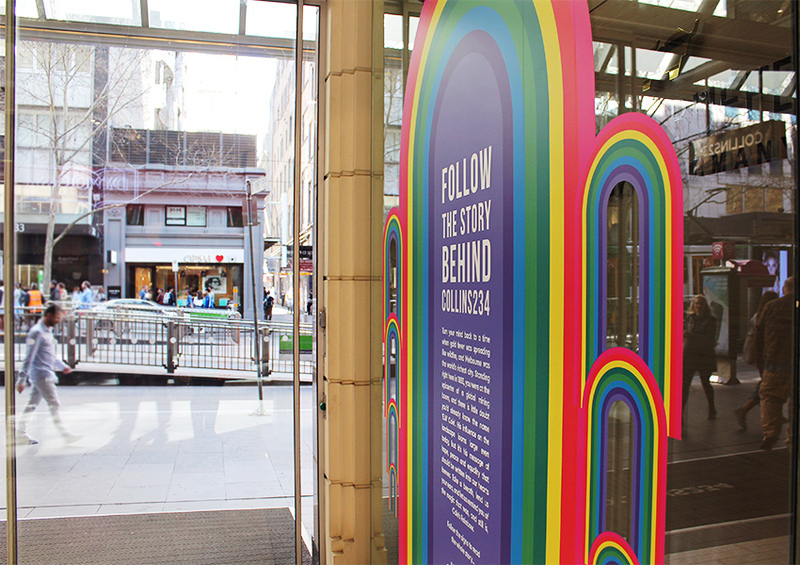 From its connection to the Book Arcade, through to its current tenants, this corner of the Melbourne CBD continues to maintain a long history of bookselling. Why establish a gigantic book arcade right here in 1880s Melbourne? Well, E.W. Cole believed that books had the potential to change the world. He was an idealist and an avid campaigner for social causes, deeply interested in the fate of humankind. He installed and operated a printing department within this Arcade and published a number of pamphlets on various social issues of the time. Books on gardening, cookery and medicine sat beside those on race relations and politics. They were produced with his own printing machines, alongside pamphlets in support of Australian Federation and in opposition to the White Australia policy. This site was a bookstore at the turn on the 20th century, but it was also a compelling advertisement for a more united and generous world. Besides books, this Arcade featured many new and curious forms of entertainment in the late 1800s, including Chinese tea rooms, a crazy mirror hall, a live band and later, a family of monkeys. A fernery provided a calm spot of respite for visitors, while Indian hawkers were enticed to sell their wares. 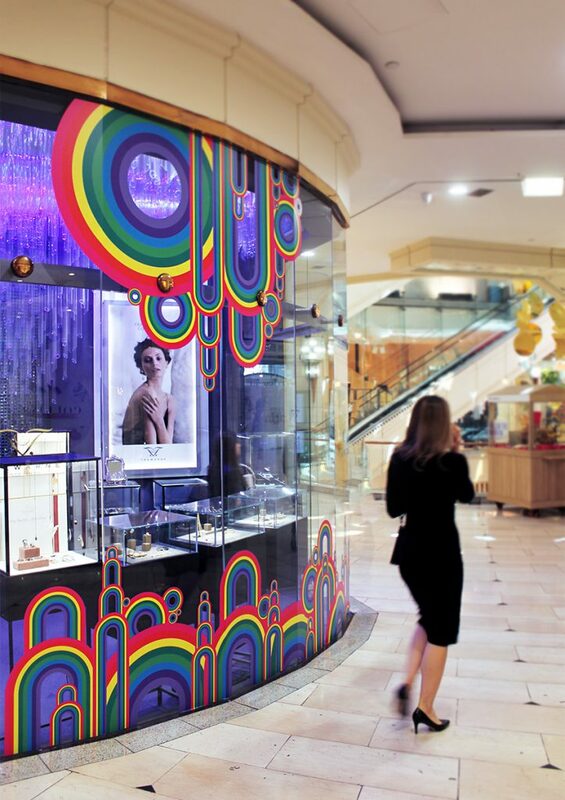 The Arcade became the place to go for anyone visiting Melbourne, the heart and soul of the city, that was filled it with magical things that celebrated the rich diversity of the world. Progressive and optimistic, E.W. Cole continued to expand and reinvent his famous Cole’s Book Arcade because he believed that stories and education had the power to unite us. 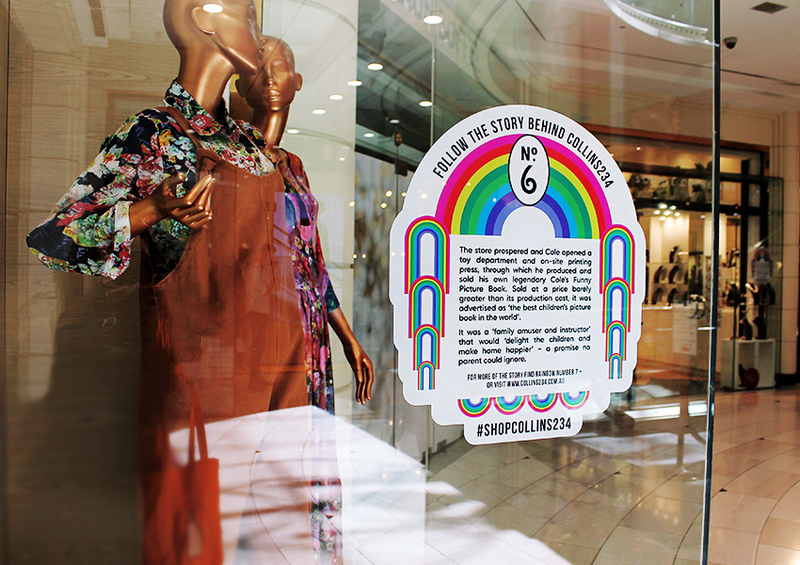 He even used a multicoloured rainbow to brand his shopfront and publications. He saw this as a symbol of peace, harmony and diversity –ideas he championed in his publications and famous advertising campaigns. 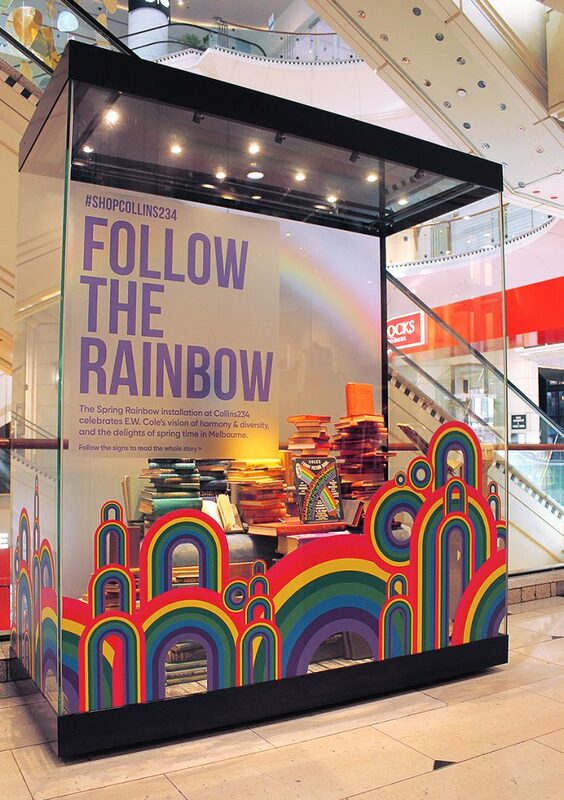 On the facades of the bookshop on Bourke Street and at Little Collins Street, Cole had an eight-coloured rainbow painted above the entranceway as a welcoming gesture to one and all. Long before television or social media, E.W. Cole used the pages of his local Melbourne newspaper to entice customers to this very Arcade. Often, he used advertising space to tell serialised fictional tales that would engage readers to read along over multiple days, leading to sell-out editions of the newspaper and clambering crowds at his Arcade. Cole even used the newspaper to advertise for a wife, a move that raised many eyebrows in Victorian-era Melbourne. While a bold retailer, Cole was a shy man. In a full column of the Herald, 5 July 1875, he set out the qualities he hoped to find in a wife. A month later he married the only serious ‘applicant’, Eliza France, and they had two sons and four daughters. In 1879, E.W. Cole published the first edition of Cole’s Funny Picture Book at a price barely greater than its production cost. It was advertised as ‘the best children’s picture book in the world’. It was a ‘family amuser and instructor’ that would ‘delight the children and make home happier’ – a promise no parent could ignore. Cole’s Funny Picture Book appealed to a wide audience. Sweet poems, suggestions of names for dolls, songs (with sheet music), historical facts and brainteasers, mazes and picture puzzles were blended with essays about a united world without borders and love between all the world’s people. There were sections dedicated to various farm animals, quaintly titled Baa Land or Piggy Land, another for ‘funny Australian native’ fauna and a piece on kindness to animals. Other sections were devoted to fashion, health, the dangers of smoking and ill-fitting shoes and geography. It was a rollicking read that was also interspersed with dark little tales, such as those about mischievous children getting their comeuppance. The cover also featured Cole’s ubiquitous rainbow and eventually sold over one million copies. It became an icon for generations of Australians, spreading its message of love, laughter and innocence far and wide. With this and other publications, Cole played a seminal role in Australian publishing, producing popular books that most people could afford. It was certainly a bestseller, but E.W. Cole’s Funny Picture Book also served as a creative form of advertising for this Arcade in the 1880s. Other promotional devices used by Cole included the production of souvenir tokens that could be collected at the Arcade. These were manufactured with various slogans that encapsulated Cole’s utopian ideals. Cole would sometimes drop these tokens in the streets hoping they would be collected by potential customers who would be enticed into the Arcade. These tokens are now among the most prized relics of the Arcade. Further editions of Cole’s Funny Picture Book continued to be produced by Cole’s descendants, including contemporary additions and revisions, long after his death in 1918. Recent reprints have been inspired by a resurgent interest in Cole and his visionary combination of retail and social concern. With future plans for commemorative works in the city to honour Cole, it appears that the story of the Book Arcade will continue to be celebrated in the corner of the city that he once made famous. Cole’s Arcade is also a feature of the Melbourne Story permanent exhibition at the Melbourne Museum, where souvenirs from the Arcade can be viewed, alongside some of the objects designed to entertain customers including Cole’s famous Little Men. While the internationally famous Cole’s Book Arcade closed its doors for good in 1929, a little more than a decade after Cole’s death, the optimism and vibrancy of E.W. Cole’s message continues to resonate today. He envisaged a peaceful world without borders, one where we treat each other as we would want to be treated ourselves. Cole may have been idealistic, and a little left of centre, but his hopes and dreams are not so different to those we have today. Cole was a man who believed in love, and that’s something to be celebrated. Lisa Lang, Chasing the Rainbow, ISBN 978-0-9804367-0-9 page 50.